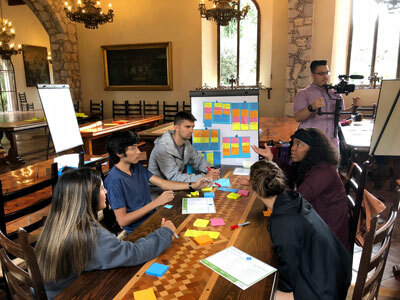 “Passions” in this context can mean anything from a global problem such as the clean water crisis, to a local problem such as finding better ways for students to connect with Aggie innovators. Attend Welcome and Closing Event or meet with an affiliated staff contact by phone or in person. Social events include kickoff and wrap-up gatherings, with many programmatic opportunities to connect in between. We want students to take the lead in designing our programming, with their efforts resulting in: shared intellectual experiences through events pitched by students; learning about people, places, and experiences outside of a student’s “current circle”; and productive collisions among faculty and peers. By the end of OCTOBER of AY2019-20, students will be able to analyze and evaluate their passions and the passions of their peers (across disciplines and majors) to pick out the ones with the most impact potential. By the end of DECEMBER of AY2019-20, students will be able to create passion project proposals and assemble a student-led interdisciplinary team in order to explore the solution(s) to a problem of their choosing. By the end of FEBRUARY, MARCH, AND APRIL of AY2019-20, students will be able to pitch their project to the I-School where resources will be matched with need as facilitated by the School of Innovation.